Dr. Andrew Sarangan is a Full Professor in the Electro-Optics & Photonics Department at the University of Dayton, Ohio. He received his BASc and PhD degrees from the University of Waterloo in Canada in 1991 and 1997 respectively. His current research areas are in infrared photodetector technologies, optical thin films, nanofabrication, nano-structured thin films and computational electromagnetics. At Dayton he created a state-of-the-art and comprehensive nano-fabrication laboratory for thin films, lithography and semiconductor processing, as a single-PI effort from externally funded research. His research has been sponsored by the National Science Foundation, various agencies of the Department of Defense and the Air Force Research Laboratory. He is a registered professional engineer in the State of Ohio, and also an FAA certificated commercial pilot and flight instructor. 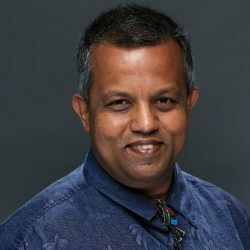 Dr. Sarangan is currently serving as the Associate Editor for the IEEE Journal of Quantum Electronics (JQE), and also as Chair of the Technical Subcommittee on “Photodetectors, Sensors, Systems and Imaging” for the IEEE Photonics Conference. He is a Senior Member of IEEE, and Senior Life Member of SPIE.